Fort Saint Nicolas at the entrance of the Vieux Port as seen from Notre Dame de la Garde in Marseille, Provence in France. 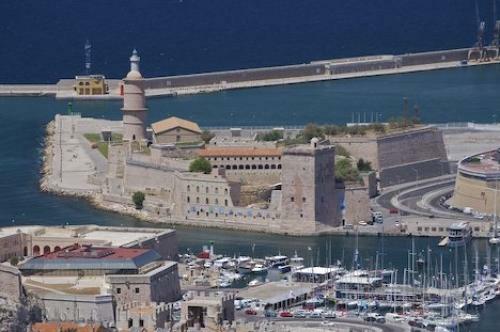 Photo of Fort Saint Nicolas from Notre Dame de la Garde in Marseille, Provence in France, Europe. ... From high on the hill known as La Garde the Notre Dame de la Garde basilica is one of the best places to get a panoramic view of Fort Saint Nicolas, Fort Saint Jean and Vieux Port in Marseille, France.Fort Saint Nicolas seen from Notre Dame de la Garde, ND de la Garde in the city of Marseille, Bouches du Rhone, Cote Bleue, Blue Coast, Mediterranean, Provence, France, Europe. I photographed this photo with the digital SLR camera model Canon EOS-1Ds Mark II, aperture of f/8.0, exposure time of 1/200 sec. on ISO 100, as always I used a original Canon Lens, the focus lenght for this picture was 260mm.